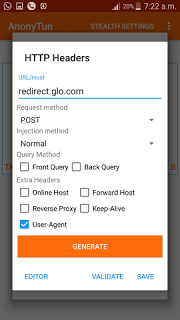 The Glo and 9mobile free browsing cheat is one of the oldest cheat that is still blazing till date. Glo NG and 9mobile has been working flawlessly with Anonytun (Annonymous Tunnel) VPN. Not just like any other VPN tunneling free browsing tricks, this VPN is quite fast and stable. The Glo Free Browsing configuration can get You any file on the internet at fast as 500kb/s to 700kb/s depending on the time and location. But the Sad part is that, the 9Mobile isn't unlimited, it was limited to 59MB per day. Be that as it may, it's still manageable, at least you can use it to chat with friends on socials and browse some few web pages. You don't need to know rocket science to set it up, all you need is your regular Anonytun VPN, then follow these steps Accordingly and you are good to go. 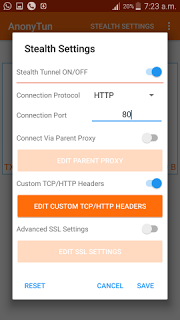 What does AnonyTun VPN Tunnel Offer? I launched Anonytun and saw “AnonyTun is ready to connect” which makes the app ready to go. It doesn't waste your time with splash screens or loading screens which is good thing because end users don’t like their time wasted. 2. After installing open the app and you should see AnonyTun is ready to connect. 3. Now look at the upper part of your screen you should see Stealth Settings. Now use the settings below to configure. 6. Once your AnonyTun VPN.apk is connected and ready for use. Like I said earlier it cant favor everybody, but this should favor a large number of people. * Make sure you change your default APN to any of these APN(s) listed below. Below is the setting needed for you to enjoy this Free browsing on 9mobile (etisalat) as it is still working fine. ᗎ After installing open the app and you should see AnonyTun is ready to connect. ᗎ At the upper part of your screen you should see Stealth Settings. Now use the texts/screenshots below to configure. ᗎ Make sure every setting you make is saved! Once your AnonyTun VPN.apk is connected and ready for use. * Fire up any browser and any other apps.